Art Deco W.B. MFG. CO. / WEIDLICH BROS. silver plate salt & pepper shaker set featuring the very art deco figural design of leaves and berries! 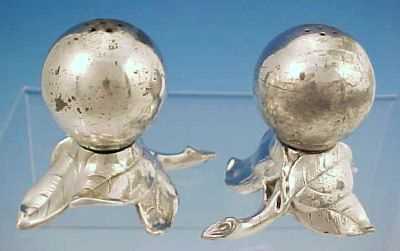 This is truly an unusual antique silver salt & pepper shaker set! This vintage silverplate salt & pepper shaker set is extremely well made, with great detail to the leaves of the bases and the stem end. The large round tops (the berry) un-screws from the base to hold salt and pepper respectively. The tops of the leaf bases show very little wear, but the round berry tops do have a moderate amount of silverplate wear and small spots of silver loss. No dents or other damage to note. Each silverplate shaker measures 3.5" tall, 2.5" in diameter and each weighs a beefy 6.8 ounces each. Touchmarked on the base of a leaf with the Weidlich Bros. logo of W.B. MFG. within a shield, the pattern number 3152 and U.S.A. You can read more about the history of the W.B. MFG. Co. / Weidlich Bros. from our Silver Manufacturers pages.